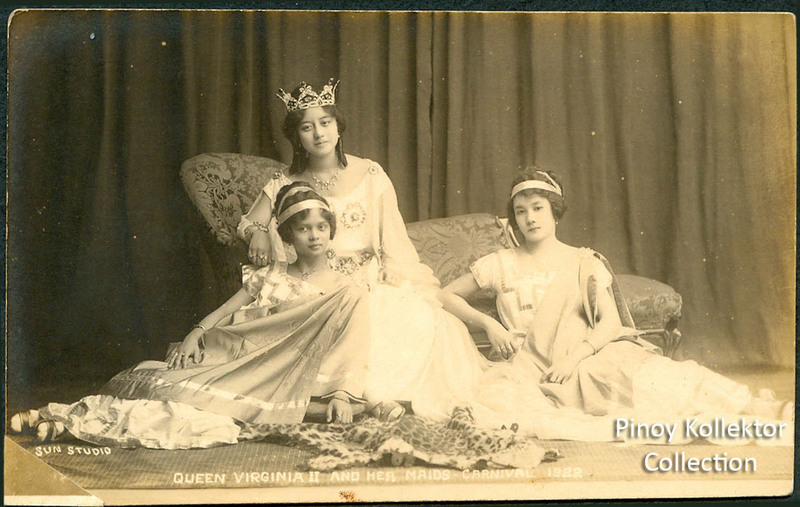 These Carnival Queen postcards reminds me of the elegant pageantry during the American colonial period. The Carnival beauty contest was a festive event. It was organized by the American government to celebrate the good US and Philippine relations. The Carnival also showcased the economic progress of the Philippines to the world. Below is an article written by Maximilus T. Tuazon about the Carnival Queens from 1908-1939. Miss Paz de los Reyes Ongsianco. “Our passion for beauty pageants owes its beginnings to the fabled Carnival Queens of pre-war Manila. 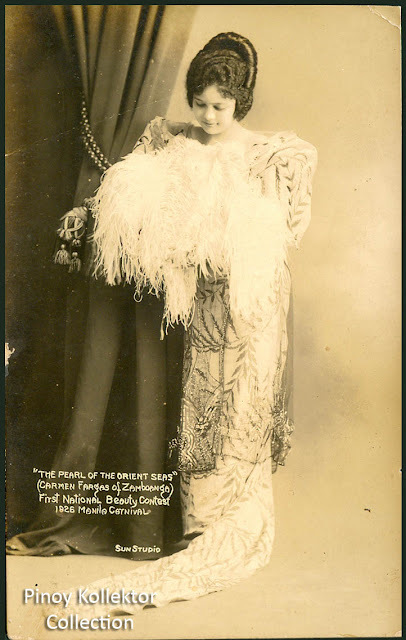 The carnival coronations evoked an aura of pomp and pageantry that ultimately gave way decades later to the sleek, highly commercialized atmosphere of beauty pageants today. The nostalgia that was Old Manila is simply incomplete without the mention of its fabled Carnival Queens. 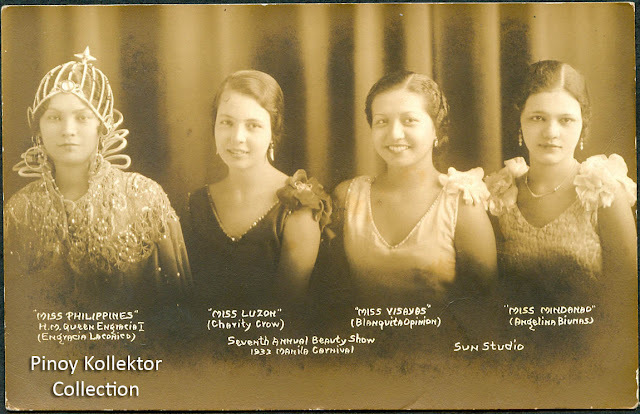 From 1908 to 1939, 31 lovely ladies presided as the fabulous Muses of the annual Carnival, imbuing pre-war Manila with a festive air as they reigned in spectacular splendor. 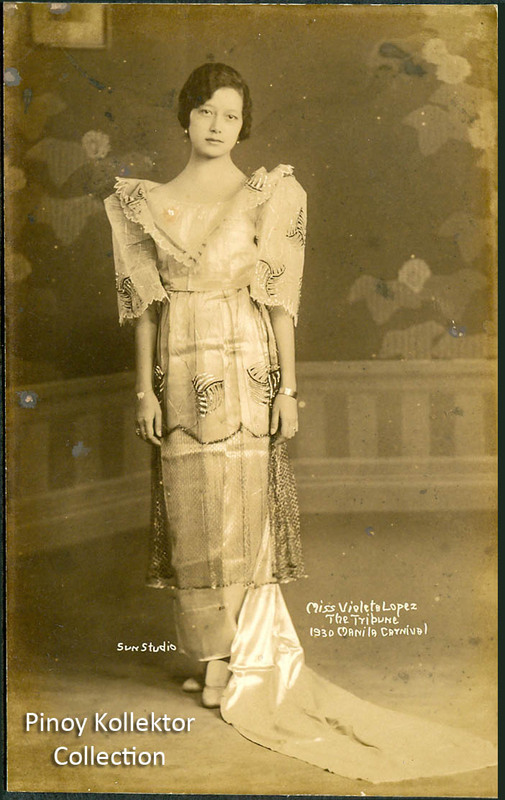 The tradition of female monarchs reigning in one of the city's special events began during the early years of American rule in the Philippines. Carnivals were then held to showcase to travelers and traders the various natural and man-made products the islands could offer. 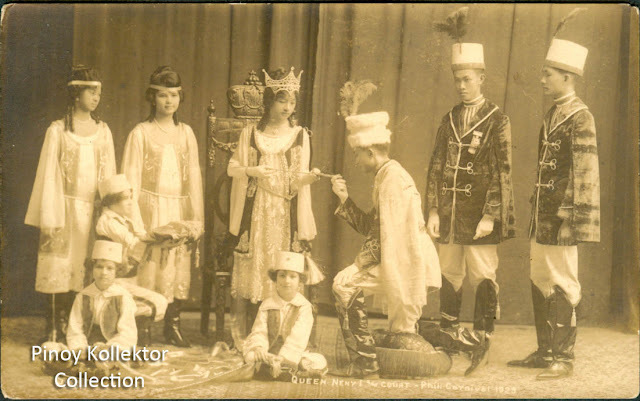 To add both glamor and glitter to these merry trade fairs, carnival organizers decided to crown a Carnival Queen who would reign nightly for two weeks. Thus was born the first local beauty pageant, literally enthroning the Filipina's unique charm. 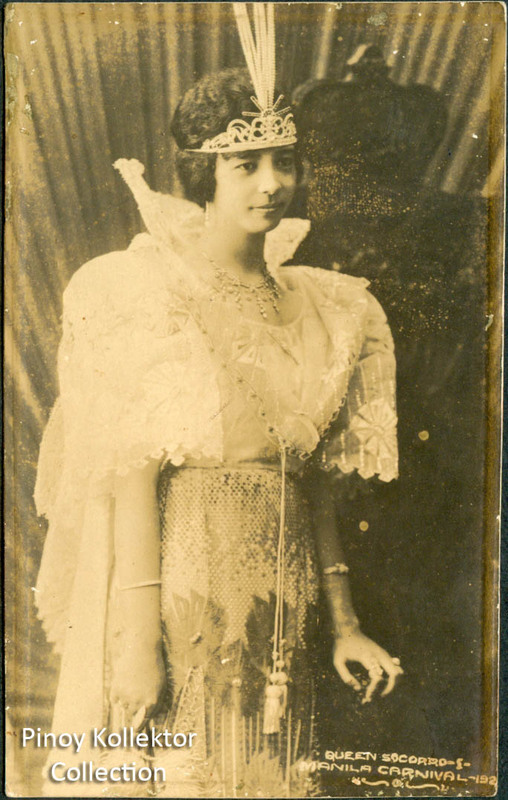 The first Carnival Queen was Pura Villanueva, who was crowned in the 1908 Carnival. Significantly, her's was that elusive Filipina quality of beauty plus brains; she was an intelligent writer whose genius was successfully wooed by the Batanguenio nationalist Teodoro M. Kalaw. 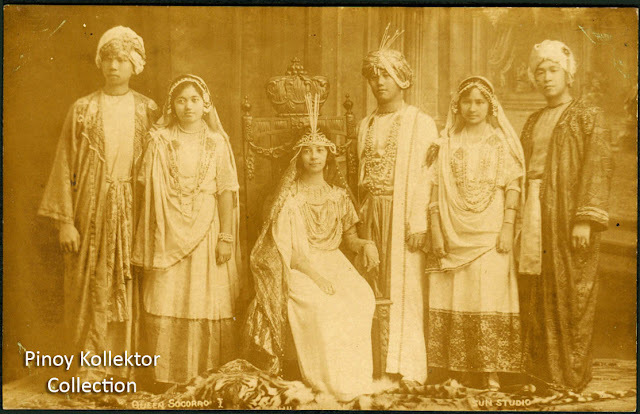 Each Carnival coronation was marked by a particular motif In the 1915 crowning of Concepcion Medina, Queen Concepcion was carried on a litter by slaves, accompanied by a Roman household of priests, praetorians, soldiers and flower girls. 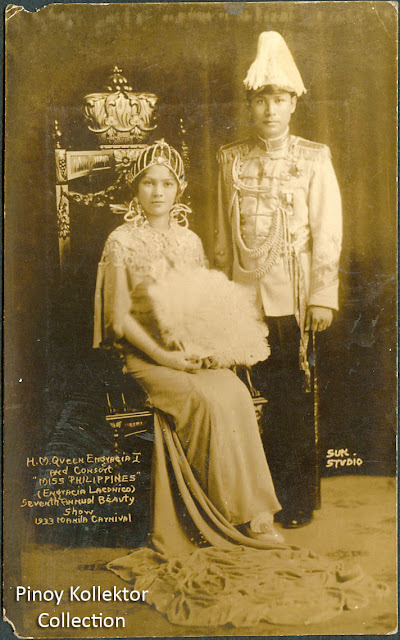 Catalina Apacible or Queen Neny I reigned as a Russian czarina with her Hussar-attired court, while Queen Emma Zamora's ornate Siamese headdress literally capped off Her Majesty's Thai coronation. But one of the most captivating was the 1925 enthronement of Carmen Papa. Her magnificent Egyptian costume failed to outdo her consort Vicente Mendoza's Rameses I attire, complete with matching Pharaoh head dress. Earlier carnival officials personally handpicked the lucky lady but later on shifted to newspaper balloting and sponsorships, although other methods were also used. 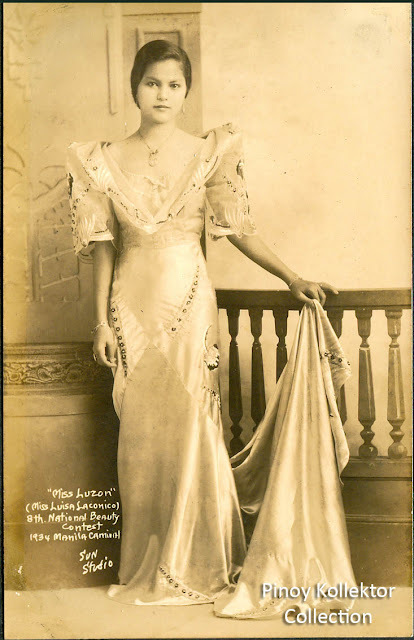 Virginia Llamas' successful candidacy was backed up by the entire studentry of the Philippine Women's College, while Anita Noble was screened on things such as her table manners. 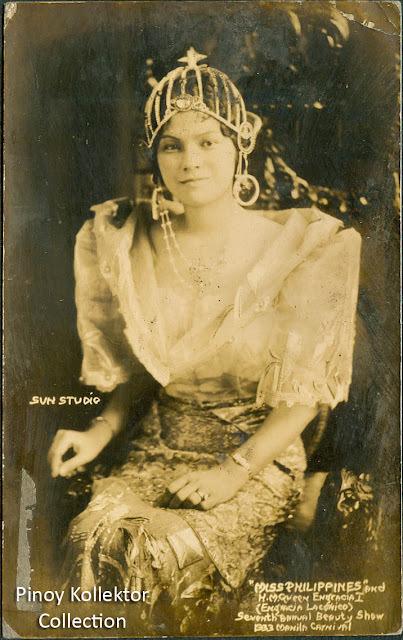 Not all Carnival Queens were homegrown beauties. 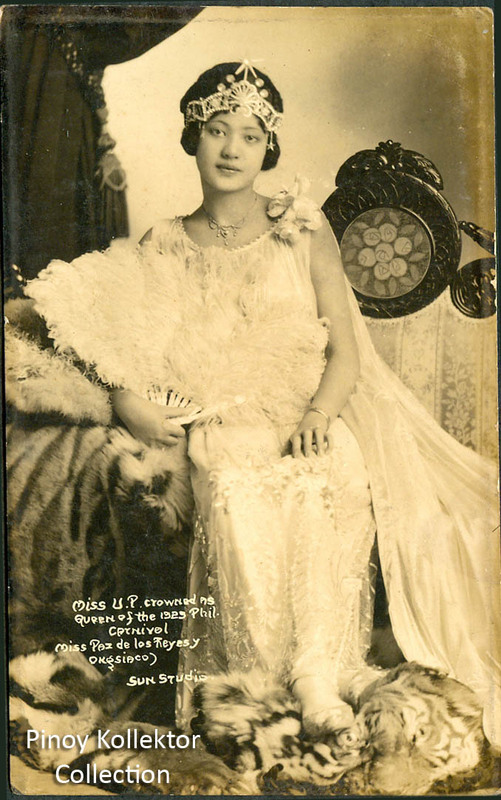 In 1917 a petite 16-year old American by the name of Mela Fairchild occupied the throne. 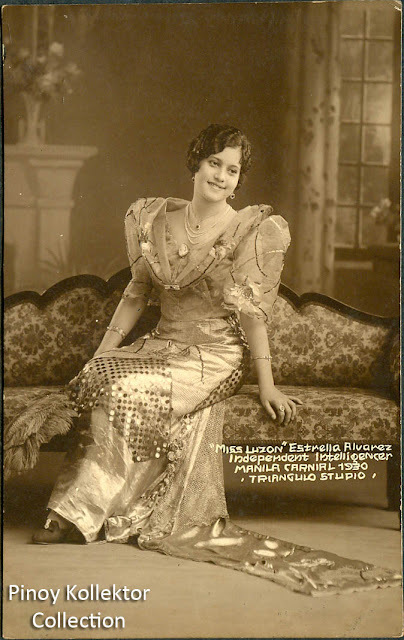 Her father, George, was the publisher of The Manila Times. Other belles such as Pura Villanueva and Trinidad de Leon jointly reigned with American beauties Marjorie Colton and Virginia Harrison as Queens of the Orient and Occident, respectively. Just like today's beauty tilts, the title-holders soon found out that their high stations were springboards to success. Trinidad de Leon's beauty was such that a tantalized Governor Manuel A. Roxas proffered marriage; she later on became President Roxas' First Lady. 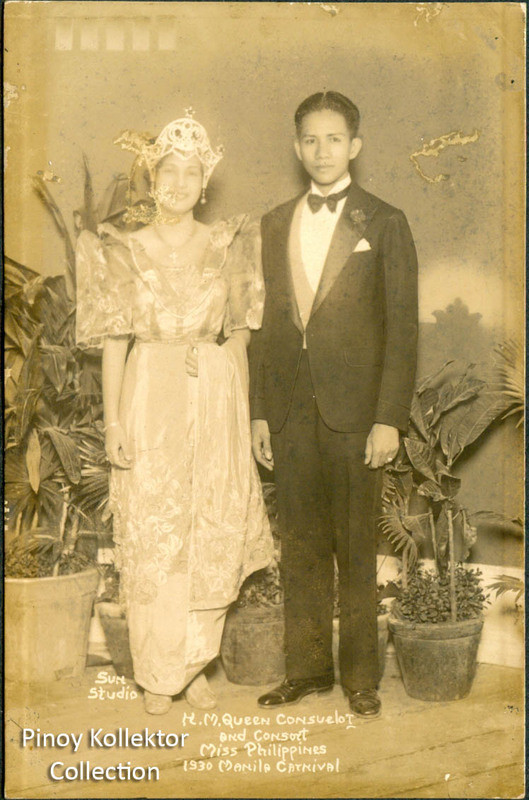 Pura Villanueva's daughter, Maria Kalaw, not only inherited her mother's crown but also her father T eodoro M. Kalaw's passion for politics, emerging as Senator Maria Kalaw- Katigbak in 1967. Although the majority of these lucky ladies were of the city's upper crust, a working-class woman could also gain the coveted title. The 1924 Carnival crowned Trinidad Fernandez, a social worker from Cuyo, Palawan. 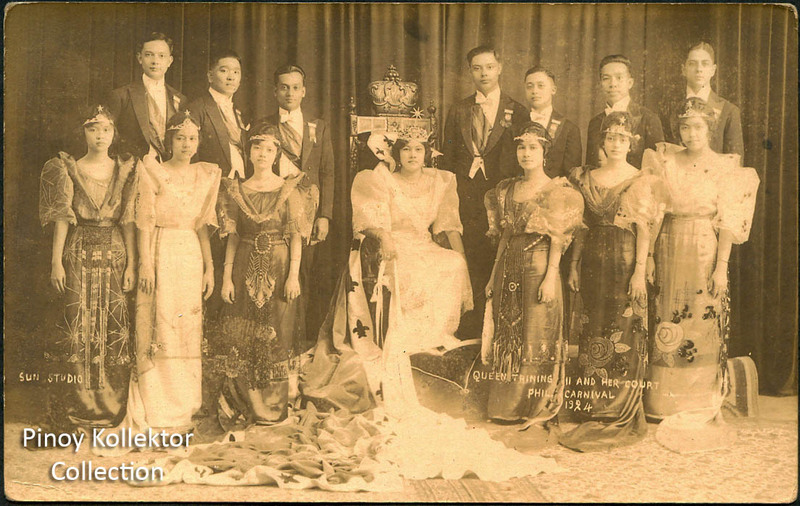 Her passion for public service was under-scored when she donated her jewelled crown to Cuyo's parish church. But the Carnival sired much more than crowns and consorts. 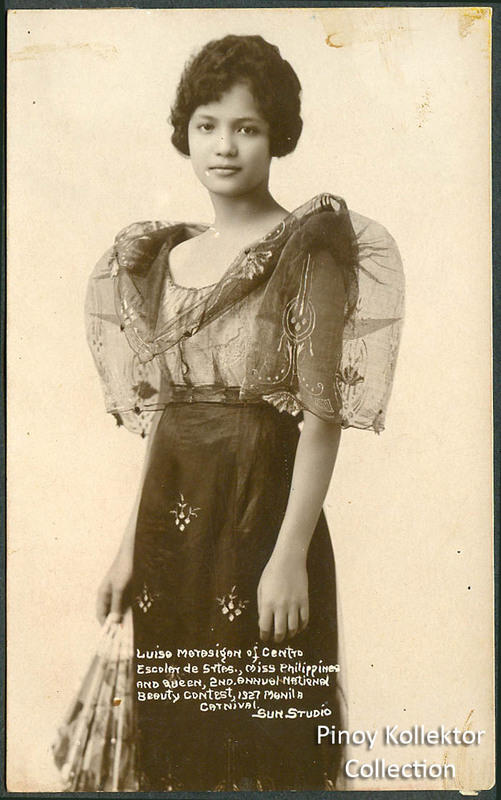 In 1926, a charming Tagalog lass was selected from representatives coming from every province of the country. 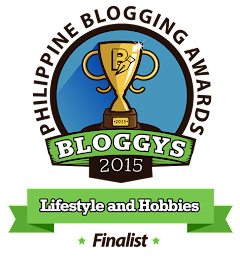 Thus, the institution that is Miss Philippines began with Miss Batangas, Anita Noble. The carnival's revelry, however, bordered on excessive extravagance. In 1926, Socorro Henson, for instance, paraded along with her Hindu court while seated majestically atop a live elephant. Another empress was adorned with so much jewelry that she Queen Maria Kalaw, 1931 had to have guards accompany her during the lavish festivities. 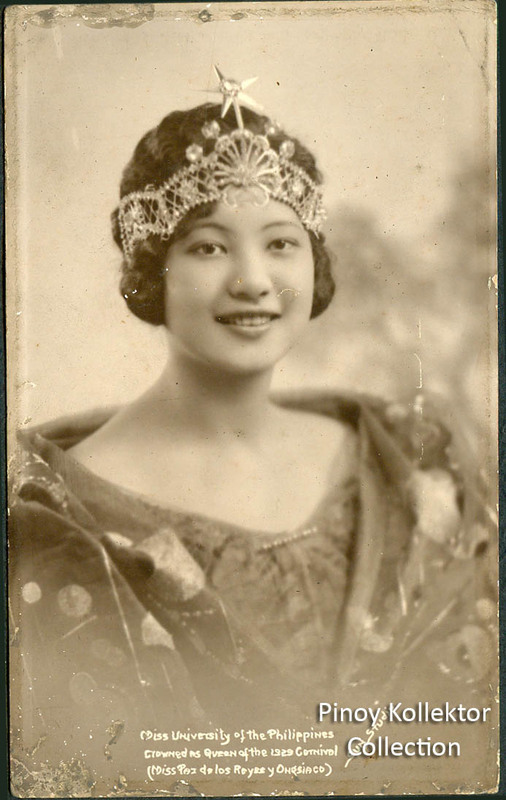 Pearl for the Orient Seas - Carmen Fargas of Zamboanga. First National Beauty Contest, 1924 Beauty Contest. 2nd Annual National Beauty Contest. 1927 Manila Carnival. 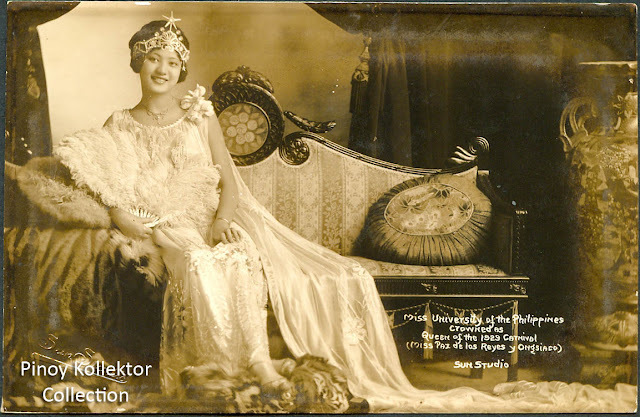 Miss University of the Philippines crowned as Queen of 1923 Philippine Carnival.